China ramped up efforts on Saturday to stave off disease for millions of earthquake victims, as more miracle rescues amid the rubble offered hope in an increasingly desperate battle to save lives. Five days after the enormous earthquake that the government estimates killed more than 50,000 people, there were rising concerns over potential disease outbreaks among the nearly five million people who have lost their homes. "Combating epidemics is the most urgent and the biggest task facing us right now," Wei Chao'an, vice minister of agriculture, told reporters in Beijing. The death toll from the 7.9-magnitude quake continued to climb as authorities cleared their way through pulverised towns and gained better access to isolated areas -- revealing a clearer picture of the full scale of the horror. The government raised the confirmed death toll by more than 6,000 to 28,881. But many expect the eventual figure could surpass the government's estimate of more than 50,000. Entire towns in mountainous Sichuan province were flattened in Monday's quake, with the main zone of destruction spreading across 100,000 square kilometres (40,000 square miles) -- an area three times the size of Belgium. The quake, which could be felt as far away as Bangkok, left mountainsides in Sichuan sheared off, roads split in two and countless thousands of buildings toppled or in danger of collapse. The spectre of poor weather conditions loomed early Sunday with state media reporting heavy rain had lashed quake-battered areas the previous night, causing a mud-rock flow in one town, with more inclement weather expected. 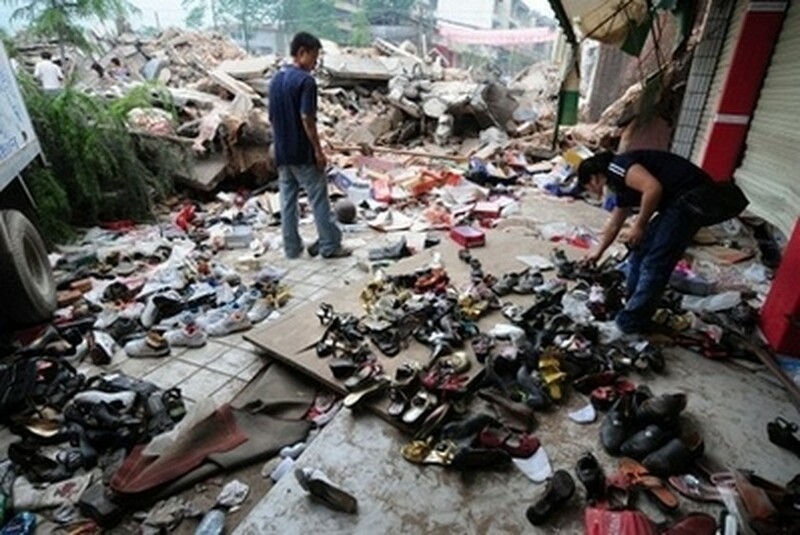 "The rainy weather might cause some houses to collapse and worsen the disaster situation," state Xinhua news agency said. Since the disaster, the most pressing priority has been to rescue those trapped amid the mass of twisted metal and concrete. Sixty-three people were pulled out of the rubble on Saturday. These included a 61-year-old woman pulled out from a collapsed residential building by Russian rescue workers, Xinhua said, adding she was in "good condition" after being trapped for 127 hours. It was the first time a foreign team had found a person alive in the search for survivors, Xinhua said. The news agency had earlier reported that a German had also been pulled from the rubble. But it later revised the story, saying that 62-year-old climber Brakus Bogdan was unhurt and had spent five days in a remote quake-hit village. The rescues on Saturday defied the warnings of experts that chances of survival were extremely small after 72 hours. "As long as people are waiting to be rescued it's possible," said Bob Tan, part of a 55-strong Singaporean team that arrived in the mountain-perched town of Hongbai. "Miracles do happen, that's why we never give up hope." Residents of Hongbai said that up to 900 of the town's 10,000 people died, 200 of them children. China initially rebuffed offers of help from foreign rescue experts, but teams from Japan, Russia, Singapore and South Korea have since begun work. Teams have also headed in from Taiwan and Hong Kong. "Where there is a beam of hope, we will spare no efforts to save the trapped," Chinese Premier Wen Jiabao said Friday. Chinese President Hu Jintao toured three of the worst-hit towns in the quake epicentre of Wenchuan county on Saturday. An aftershock struck during his speech to rescue workers, Xinhua reported, though it did not elaborate. He later thanked the international community for coming to China's aid. "On behalf of the Central Committee of the Communist Party of China, the State Council and the Central Military Commission, I express heartfelt thanks to the foreign governments and international friends that have contributed to our quake-relief work," Xinhua quoted Hu saying. As the rescue effort pressed on, other authorities focused on supplying fresh drinking water and improving sanitary conditions for the 4.8 million people who lost their homes and are living in tent cities or in the open. China's health ministry said it could not rule out major epidemics, explaining that rudimentary sanitation and uncertain access to safe water and food supplies were a potentially lethal breeding-ground for infectious diseases. China's top veterinarian, Li Jingxing, said the rotting carcasses of 12.5 million livestock and poultry killed were also a major risk. "We are adopting measures such as deep burial to ensure that no epidemics are caused," he said.